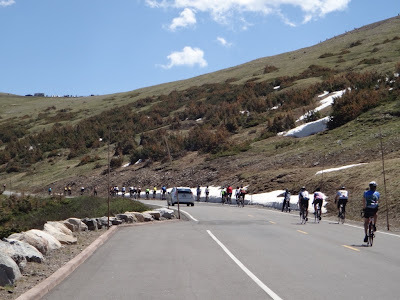 Photograph 1 - Ascending Milner Pass in the Rocky Mountain National Park, Colorado - there were over thousand pushbike riders that joined us. 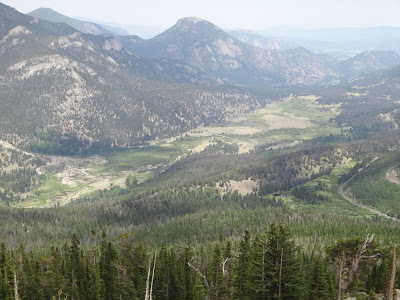 Photograph 2 - On top of the world - Rocky Mountain National Park view (about in the centre of the park). 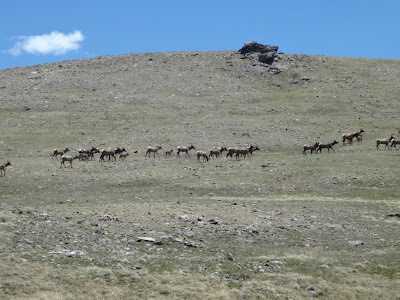 Photograph 3 - Herd of elk at 11,000 feet asl in the Rocky Mountain National Park, Colorado. Photograph 4 - Strangely enough the temperature was a warm 24 deg C at this location. Photograph 5 - Scene from the eastern end of the Rocky Mountain National Park, Colorado. There was a dam burst in the early 1900s at the bottom of this valley. Note the alluvial spill on the left before the flat part of the valley. Photograph 6 - Many ice pockets were passed. This one has a board walk for all to slip and fall. Photograph 7 - The road at 11,000 feet is above the tree line and into alpine territory. Another beautiful day in paradise! 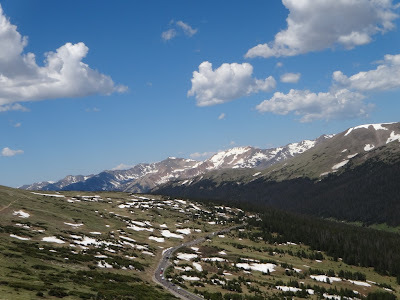 We left Winter Park and headed north to the Rocky Mountain National Park toll booth about 50 klms away. The ranger informed us there are over one thousand pushbike riders in front of us and suggested to come back another day. If we proceed ahead there could be delays of up to half hour or so. We decided to press ahead thus taking our time - we had all day to do this. Now what is this National Park all about you may ask? It is part of the world's longest mountain barrier. 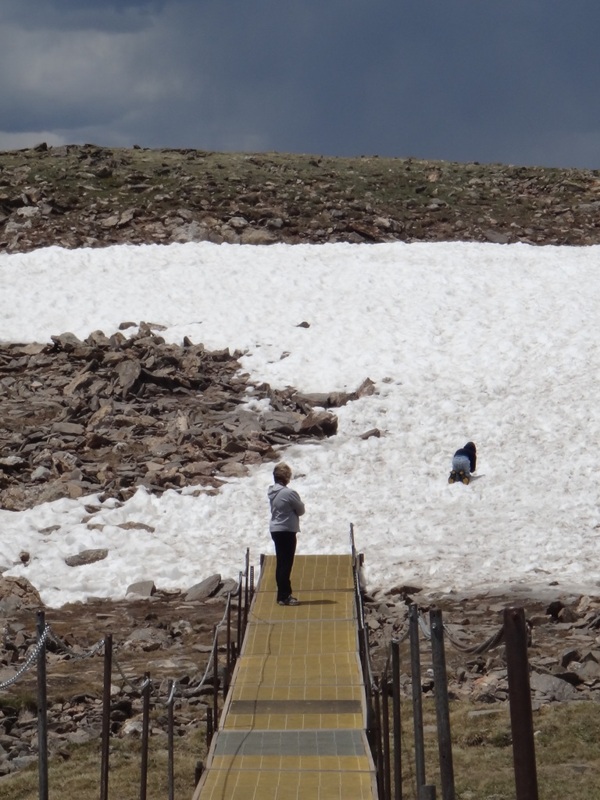 It embraces an alpine tundra scenery which actually tops out at 12,200 feet. 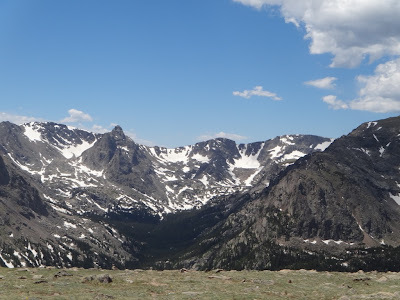 One third of the park is above treeline and the scenery is superb - except for the thousands of pushbike riders. 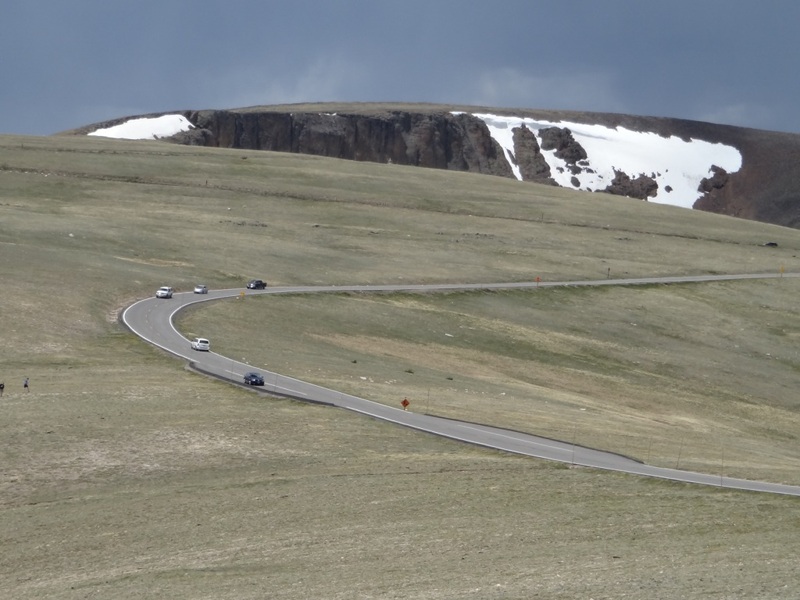 In fact they did not worry us at all as we just drove at 15MPH and cruised along enjoying the views. We had the top down on Connie and Anne the resident photographer snapped away on all sides. It's great when there are no windows to photograph thru. At the top there were herds of elk (no bloody bears yet) and plenty of pushbike riders - oops they are not endangered species yet! We had taken a cut lunch and enjoyed the warm weather on the eastern entrance. Hence we turned back and followed the road back to Winter Park. This time we only saw pushbike stragglers (tail-end charlies or fatties who found it tough going) and heaps of trucks taking away port-a-loos. The journey back was effortless and just as spectacular. Back in Winter Park we refuel Connie and did some laundry at the local "mat" and later Anne is cooking dinner - with a little bit of help from Neil. Anne has cooked dinner for the past two nights which she really enjoys. It has been over five weeks since she had to turn on a stove. Did we tell you we cooked lobster tails last night? They were cheap and delicious. We also paid a visit to the Wells Fargo bank yesterday. Most banks in the US rural area are outside the main streets and have drive-through ATMs!!!! You just drive up to an ATM reach out of your car window and hit buttons and whallah - money pops out. Tomorrow we leave Colorado and head back into Utah (yeh the Mormon State). We will be staying at a place called Moab - famous for Canyonlands National Park and the Arches National Park. It will be a long drive so until we access a Wifi - cheers.